It's 2 AM, your linear algebra final is in 6 hours, and you gulp down another espresso. You start thinking: "I wonder how this espresso and other drugs actually work?" We are here to lead you through an interesting experiment where you will use drugs, such as glutamate and nicotine, to change the firing rate of the cricket cerci system's neurons. In this experiment you will learn how different drugs and chemical agents affect the nervous system using the cricket cercal system. You will also learn how to create a few different chemical solutions. We have been studying "spikes" in the last couple experiments, and we will continue to do so here, but now we are also going to study the synapse! 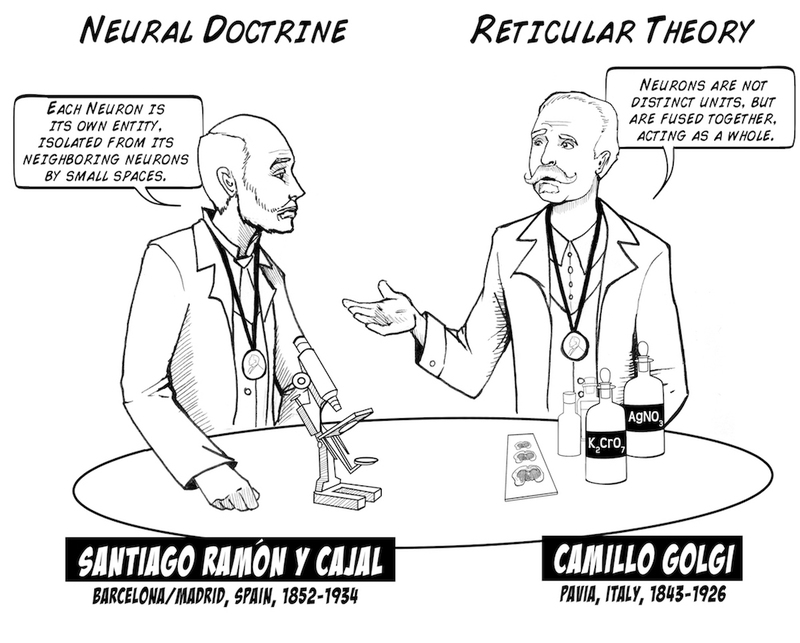 Recall our first experiment, where we explained that neurons communicate with a combination of electricity and chemicals, and that each neuron is distinct (the "Neuron Doctrine" of Santiago Ramón y Cajal). Once a spike reaches the end the first neuron, it can cause the neuron to release "neurotransmitters" across the small distance between the two neurons called the "synapse." These neurotransmitters bind to receptors on the second neuron, which then cause the second neuron to begin firing spikes (or stop firing spikes, but let's keep it simple for now). These receptors are very sensitive to electrical activity and certain chemicals. In fact, the very sensitivity of these receptors is how neurons, and ultimately you, learn! And a more realistic view of the synapse. 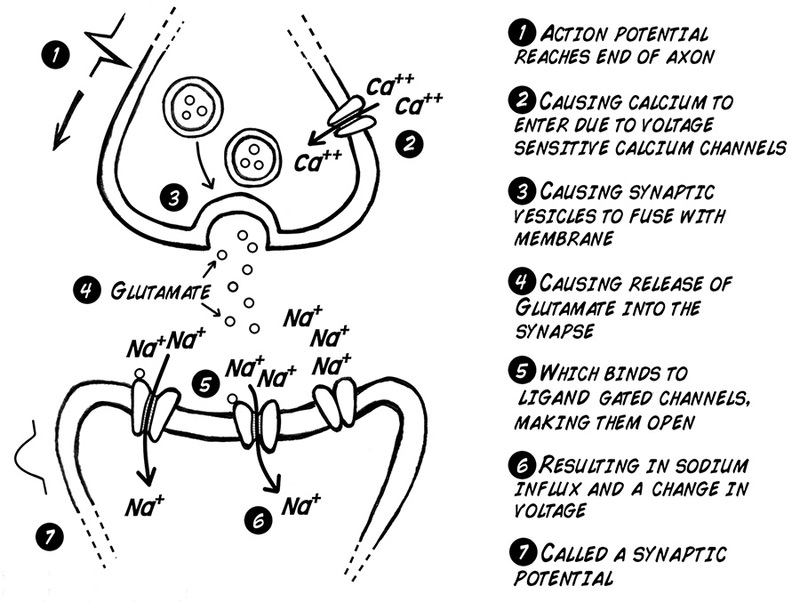 What occurs in the synapse..
And how it affects the next neuron. In this experiment we will test the effect of neuroactive compounds on central nervous system neurons. 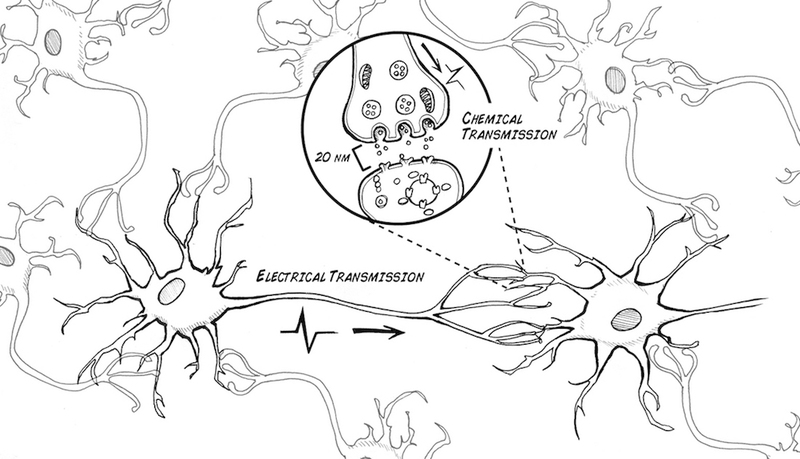 Obtaining drugs that affect neurons can be quite difficult, as they are often very dangerous (like the Batrachotoxins of poison dart frogs or the tetrodotoxins of Fugu Puffer Fish, both of which block sodium channels) or are drugs of abuse (like cocaine, which allows dopamine to stay in synapses longer than normal). But, we have access to two types of drugs we can use on our insects. Nicotine comes from the tobacco plant. Tobacco evolved nicotine to prevent insects from eating its leaves. 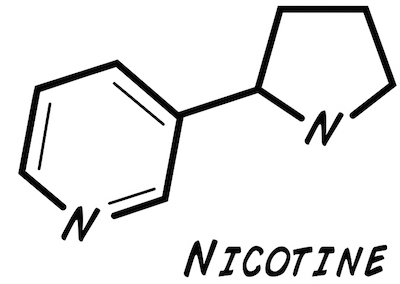 Nicotine is a powerful acetylcholine receptor agonist; it amplifies the effect of acetylcholine binding to its receptors in synapses, causing a neuron to fire more (due to increased sodium ion influx). Whereas nicotine is a drug that acts on receptors that neurotransmitters bind to, Monosodium glutamate itself is a neurotransmitter. Once dissolved in water, it turns into positively charged sodium ions and negatively charged glutamate ions. Glutamate is normally part of the metabolic pathway of glycolysis (breakdown of sugar) and is readily available from the foods you eat. In fact, over 80% of the synapses in your brain use glutamate as its excitatory neurotransmitter. In insects, is it excitatory as well? Let's find out! To create your nicotine solution, take a cigarette or small cigar, remove all the shredded tobacco leaves, and place them in a small container (a clear pill bottle, for example). Fill the container with water, put the cap on, shake up the mixture, and allow it to sit for a couple days to extract the nicotine. Over time the solution should turn yellowish-brown. If you are in high school ask your teacher or parent to help you prepare this solution. Alternatively, you can also directly purchase 40mg/mL Nicotine Solution from Amazon for about $12. To create your glutamate solution, you need to find some monosodium glutamate! You can often find it at your friendly neighborhood Asian import grocery store. A pound should cost a couple dollars. Fill up a clear pill bottle about a quarter full of the MSG salt crystals, fill the remainder of the bottle with water, and shake thoroughly to dissolve the MSG. Note that not all of the MSG will dissolve, as you are making a saturated solution. Do some online research or ask your teacher to find out what a saturated solution is. For reasons we haven't figured out (or really worked hard enough on yet), the cockroach leg preparation does not lend itself well to neuropharmacology experiments. 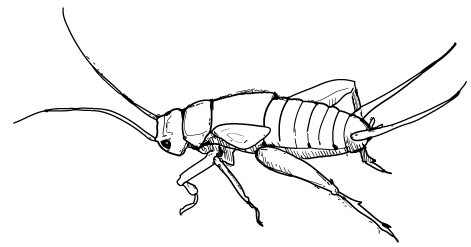 Maybe you can prove us wrong, but for now, we are going to switch to a new species, the cricket cercal system! Wait about 2-4 minutes for the neurons to "warm up" and then blow gently on the rear of the insect. You should see the cerci move from the pressure of your air puff. 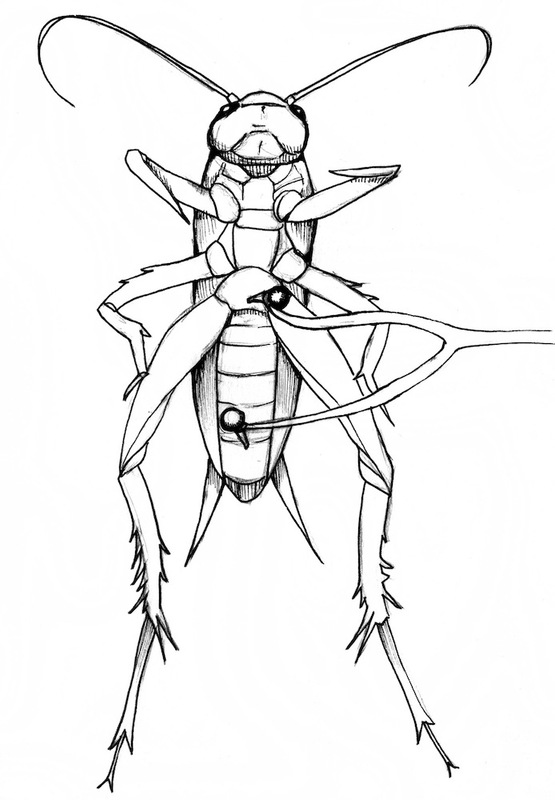 The cerci are sensing organs on the rear of the cricket that are sensitive to wind vibration. You should also hear an increase in the spiking activity on your SpikerBox. Note that these spikes are not as loud as the spikes you are used to hearing with the cockroach leg prep, but if you are lucky you should hear them. Now take a small syringe (you can also buy this at local pharmacy over the counter) and inject a tiny bit of each solution into the cricket near one of the electrodes. What do you notice with the two different solutions. Can you explain any peculiar effects you hear with regards to spiking rate? What are some other easily acquired substances that you think would have an effect? What effect(s) do they have? Try altering the concentration and amount of substances you inject-how does this change things, if at all? 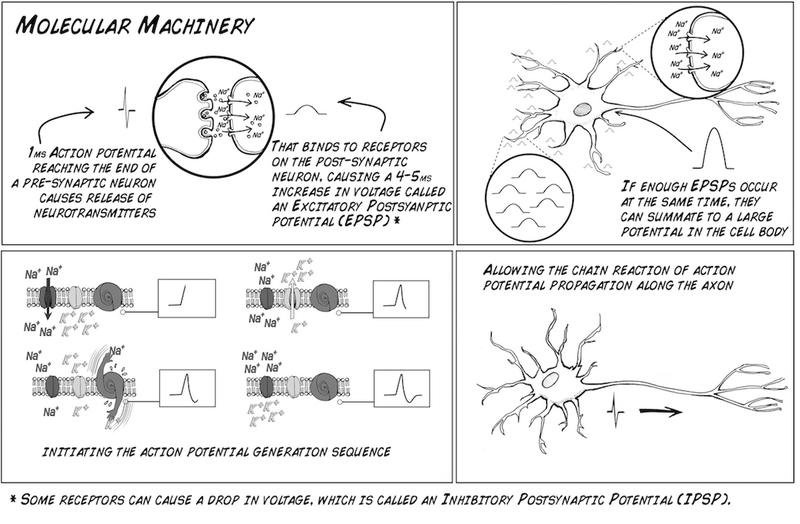 Why do the neurons need to "warm up" even if we are injecting things that should cause them to spike? Does the location of the injection change anything? Why or why not? Why don't we have such immediate and dramatic responses as the cricket did when we we ingest these substances?